I have to admit I find it easier to be creative when I have a purpose. If it's someone's birthday, a wedding, Christmas time or a baby. It's just so much easier to try and kick off a crafting session when you have someone in mind for the card. A good friend of mine is having her first baby in March and I was attending the baby shower on the weekend. I used the A Little Wild stamp set to make this card. Along with Swirls and Curls embossing folder on the base card stock. 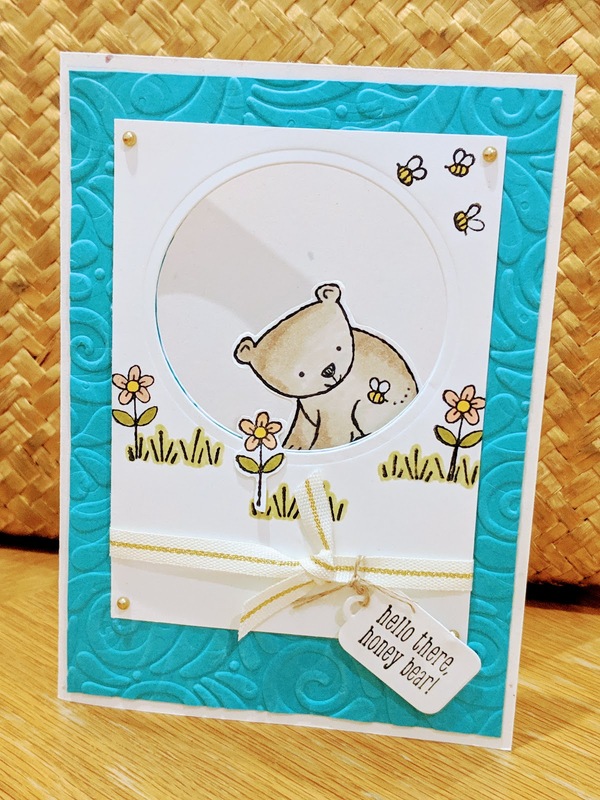 I also used a Layering Circle Framelit to cut out the circle that the cute little bear is peaking out from. I completely forgot to take photos the day I made it so these were snapped on my phone before heading out. My forgetfulness means I forgot to take a photo from the inside. If I had you would have seen that I had stamped another image of the back of the bear and layered it so you could see it on the inside from the back. Oh and I water coloured it all in using Stampin Blends. They are super easy to use brush markers that come in two tones of each colour - a light and a dark. You just use both pens and a few layers to create a water colour shaded effect. Hope you like it and this inspires you to join me in making 2019 your most creative year ever.